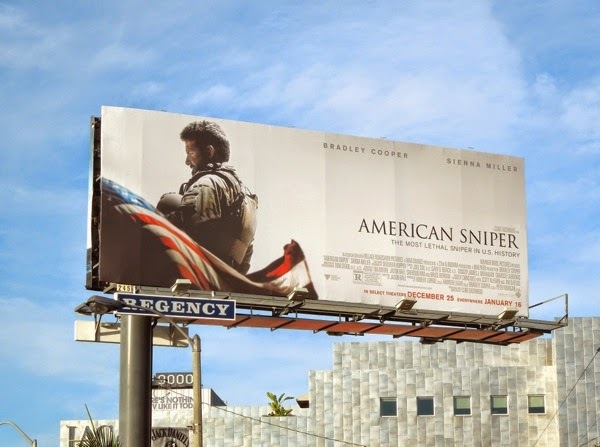 There's no surprise that with his love of guns Clint Eastwood would direct American Sniper, hoping to hit the target with audiences in the coming months with a story about the most lethal trained marksman in U.S. history. Bradley Cooper stars as the Navy SEAL 'Chris Kyle', based on his 2012 autobiography of the same name, and recounts his military career and deployment in Iraq and his struggles to be a good father and husband (his wife is played by Sienna Miller) despite his life-threatening and taking job. 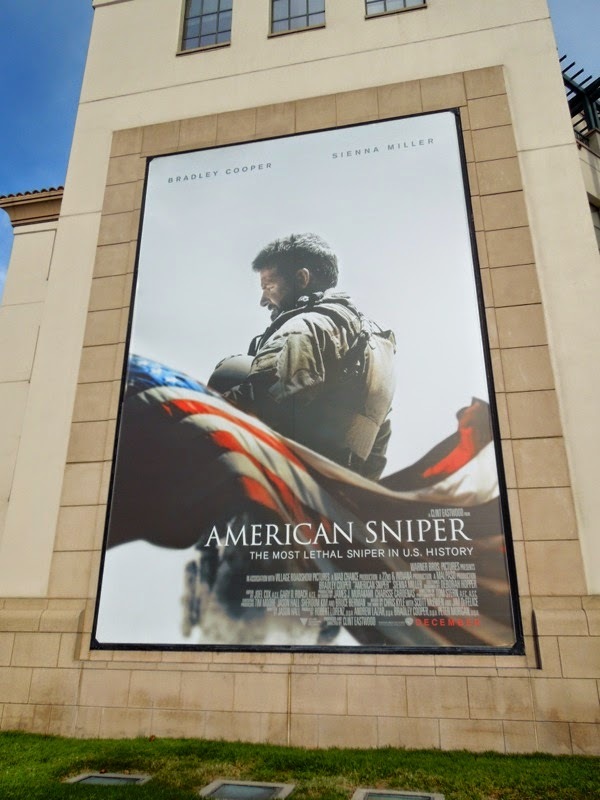 The portrait theatrical release billboard was spotted at Warner Bros. Studios in Burbank on November 22, whilst the patriotic landscape billboard creative was snapped along Sunset Boulevard in West Hollywood on December 4, 2014. If you're an admirer of Bradley Cooper, be sure to also enjoy these American Hustle movie billboards and The Hangover movie franchise billboards. Plus if you're a fan of actress Sienna Miller, be sure to check out this giant HBO movie billboard for The Girl, where she played Alfred Hitchcock's muse, Tippi Hedren. Let's hope this movie isn't just a glorification of war and an advert for the NRA, and actually has some compelling insight about P.T.S.D. and what it's like to be paid by your country to kill for a living. 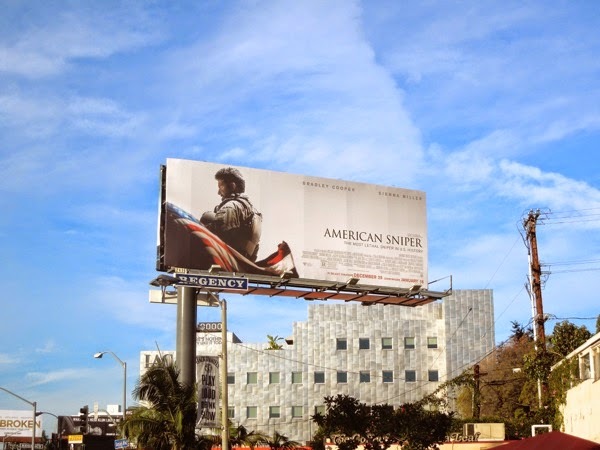 UPDATED: Here's another billboard for the movie on a much clearer day further east along Sunset Boulevard on January 3, 2015. 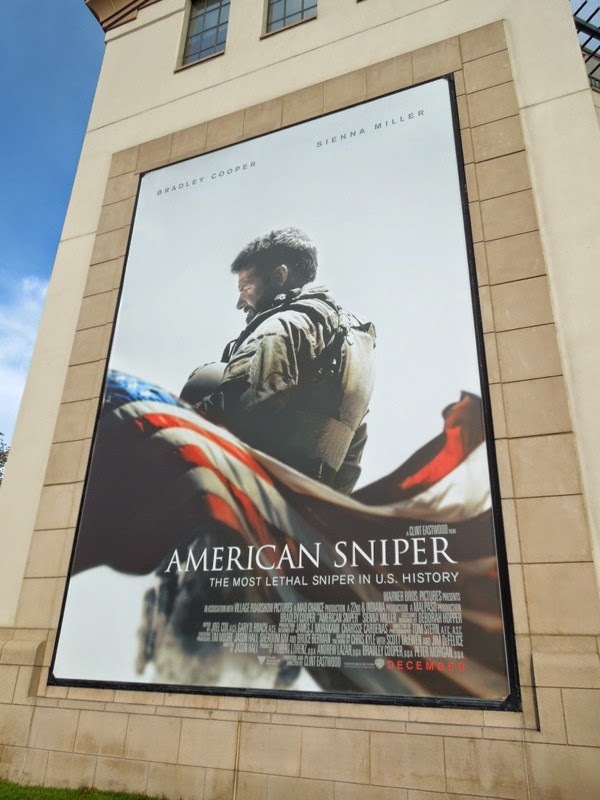 UPDATED: American Sniper has proved phenomenally successful at the U.S. box office, already grossing over $284 million, regardless of the criticism that the film is pro-war propaganda. 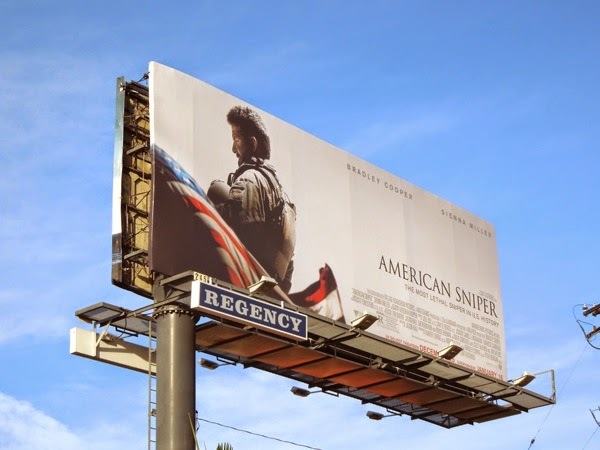 The movie has also garnered six Oscar nominations, including for Best Picture and a Best Actor nod for Bradley Cooper. 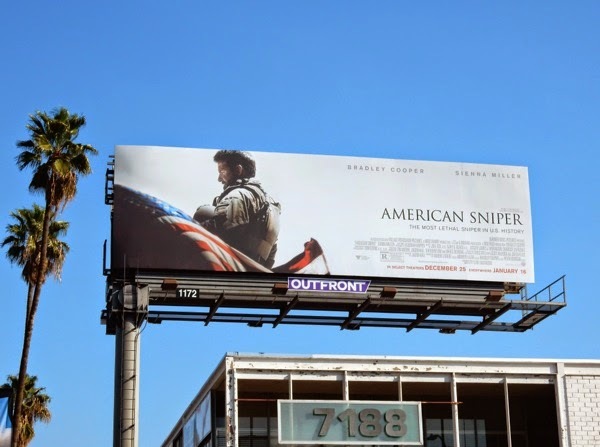 This Academy Award nominee billboard hoping to sway voters was snapped along the Sunset Strip on February 3, 2015. 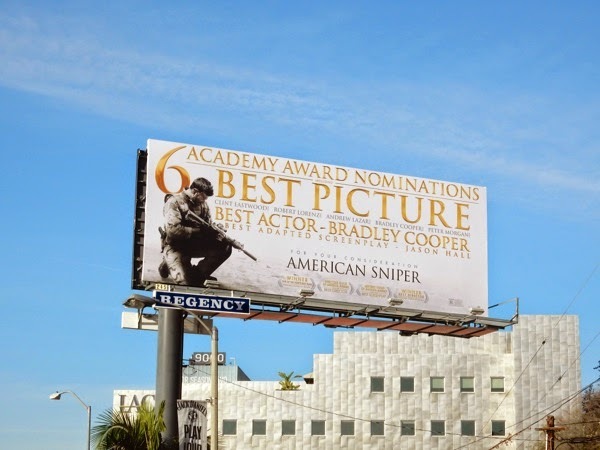 Plus be sure to check out all the other 2015 Oscar contender billboards battling it out for your attention in the skies of L.A. in the run up to the awards ceremony on February 22, 2015.